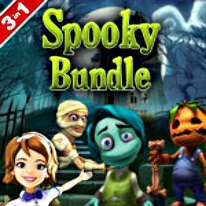 Prepare to be chilled, charmed and challenged all at the same time with this Spooky Bundle! Join the happy haunts in The Happy Hereafter, a casual sim in which you guide the newly dead as they build an afterlife for themselves and their fellow lost souls using your uncanny management skills! In Spooky Mall, you manage five stores packed with the goods ghosts love! When do ghosts come out to shop? Midnight! And that's when your shift begins! In Haunted Domains, you are the manager of a haunted hotel, you're in charge of tending to the needs of an assortment of amusing creatures of the night. Guide Sheila Sullivan as she checks in guests, serves dinner, cleans rooms and performs special tasks in an effort to keep her ghoulish guests happy.